In agile environments you reduce big upfront design, because you know that customer requirements will change. Capturing requirements as User Stories is the most common approach. User stories are short and easy to use. They serve as reminders to have a conversation about the requirement. Jeff Patton, the father of Story Mapping says, they are called stories, because we’re meant to have a conversation – tell a story – about them. Never miss a 1-pager – Subscribe to our free newsletter! 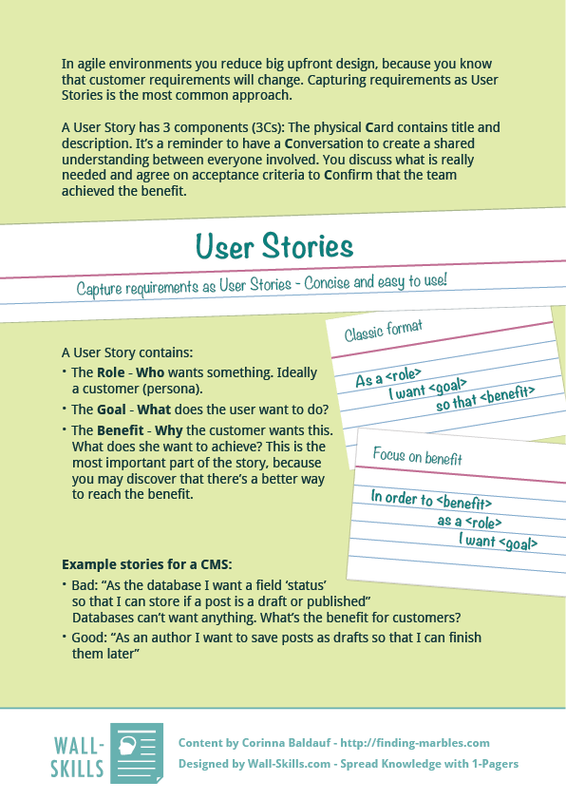 User Stories – Capture requirements as User Stories – Concise and easy to use! In agile environments you reduce big upfront design, because you know that customer requirements will change. Capturing requirements as User Stories is the most common approach. The Role – Who wants something. Ideally a customer (persona). The Goal – What does the customer want to do? Databases can’t want anything. What’s the benefit for customers?